During a couple of months myself and my colleague Ntabwoba Robert have been working as consultants for the Norwegian Church Aid/NCA (an international NGO with support from among others SIDA- Swedish Development Aid). 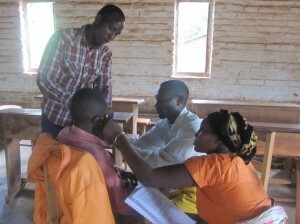 We have given trainings in Trauma Tapping Treatment to NCA´s partner organizations in the eastern part of DR Congo. That means in the conflict and war ridden provinces of North and South Kivu. Presently the situation is somewhat calm. Presidential election is to be held in June 2011 which can be a source for escalating tension. 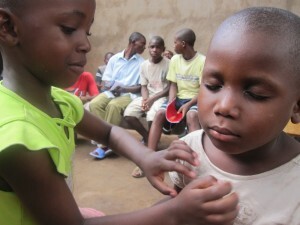 But we put our hope to PEACE for the Congolese people in the new year of 2011!!! 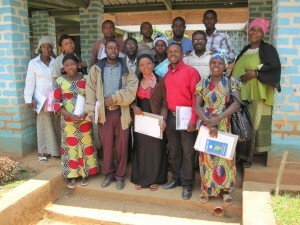 We held three-day workshops at seven different locations – from Goma in the north to Uvira in the south. 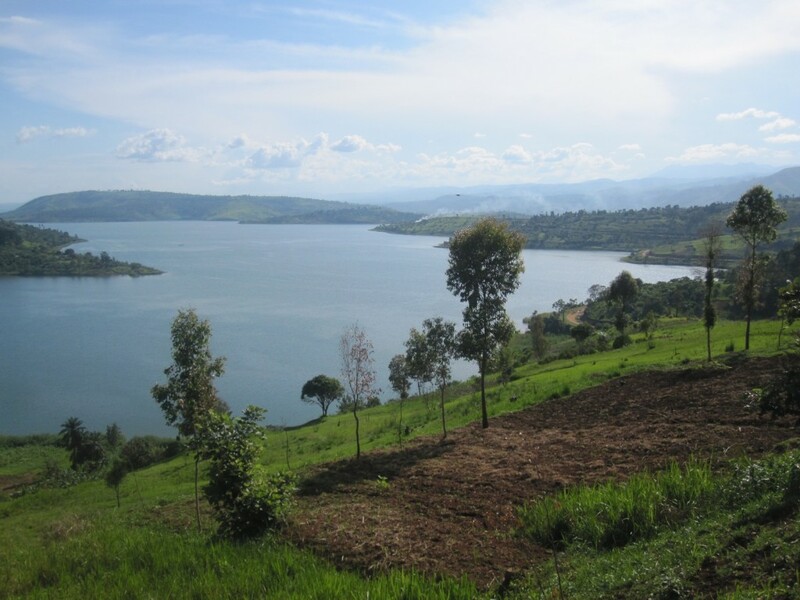 A lot of traveling along rough roads (not always very safe), but also crossing the Lake Kivu to reach Goma (the capital of North Kivu) from Bukavu (the capital of South Kivu). 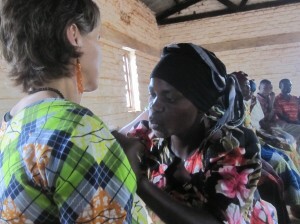 All of the participants work with different vulnerable groups: women who have been raped, widows, former child soldiers, people living with hiv/aids, Bambuti pygmies (who are heavily discriminated) and others. 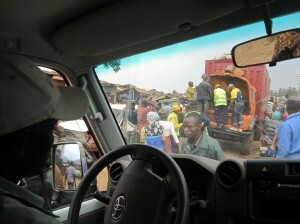 The first journey out from Bukavu towards the place called Walungu did not start very well Just after some kilometres we met a truck – that at the same time is a “bus” – all the passengers on the back waving screaming: “Rudia! Rudia!!! !” (Go back! Go back!!) and making a sign with the side of the hand over their throats – meaning: they are killing people further along this road. The driver did turn back. Very fast. But after a kilometer somebody from Walungu called and said that now it was over. The attackers were gone. So the driver turned again! I can tell we did not feel safe. 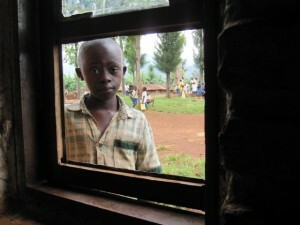 But for the Congolese in this area they are like used to situations like this. Ten minutes later “it is fine”. But inside you feel: roads are not always for transport, sometimes they are just a trap. We treated ourselves there in the car, trying to calm down. And nothing happened . The attackers were gone. Nobody had been killed this time, “only” armed robbery . Two days before all passengers of a car were killed almost on the same spot. Poor Congolese. This is the reality. The trainings were well appreciated. We had time enough to make sure that the participants knew how to treat with TTT and how to teach others how to do it. This was so called Training of Trainers. 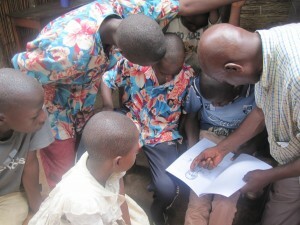 The last day of the workshops was done in the field with the respective organiZation´s beneficiaries. The Robert and myself were there as facilitators in the background just assisting if needed. Most of the times it went very well and everybody surprised how simple and efficient this method is. A comment that appeared more than ones was: ”With this training we have realized that we are all traumatised” since also the participants themselves live under difficult and insecure circumstances. And they listen to many, many horrific stories told by their beneficiaries which makes them suffer from what is called “secondary trauma”. Apart from TTT we also teach DO-In, a Japanese self-massage method (both methods are shown on video at the website www.peacefulheart.se). 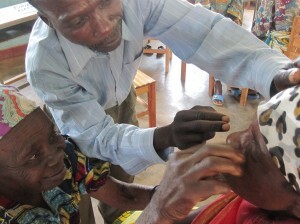 When we did a follow up after some weeks we were more than astonished by how many people the participants had already treated and trained: for example in a place called Kalehe the 20 participants had treated at least 500 people in ten days time. “In general we can say that all members of our association have been de-traumatised by and trained in TTT. We must say that the advantages with this method are huge and its impact remarkable in the social lives of our members. 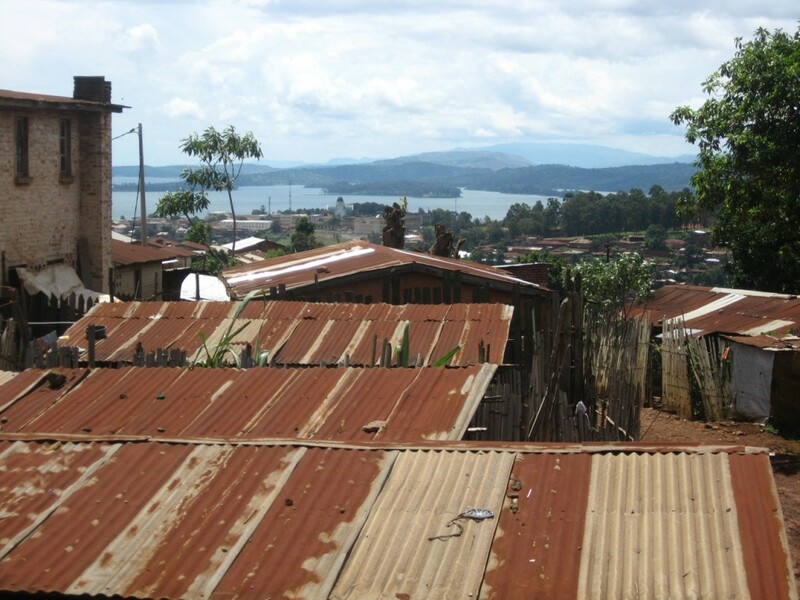 Bukavu by Lake Kivu, the capital of South Kivu province. 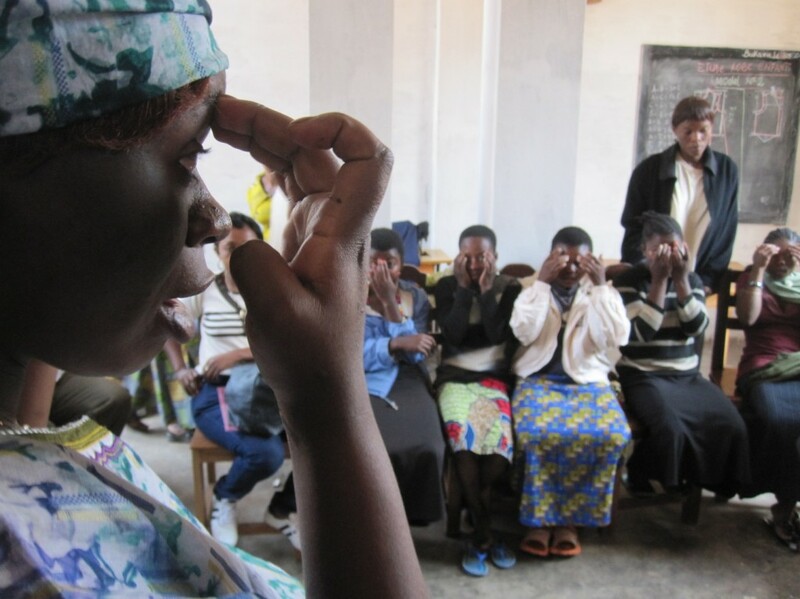 Participant from LAV – “Let Africa Live”- in Bukavu practicing the TTT with girls rescued from the armed groups. 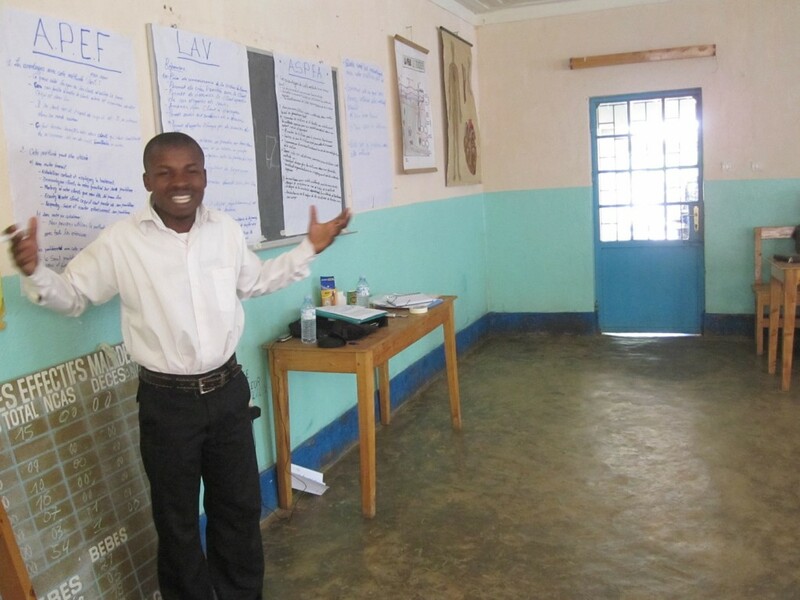 LAV in the town of Uvira give training to street children, former child soldiers and other vulnerable children. 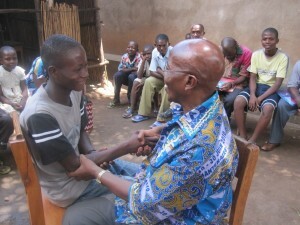 Etienne, former child soldier, treating his teacher and trainer Mr Primo at LAV in Uvira. The TTT is easy enough for a child to do it. They often learn it faster than the adults. Discussing the drawing with the treatment points. On the way to Kalehe where horrific stories of violence and atrocities are told. 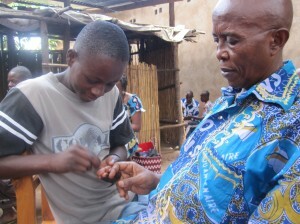 Ntabwoba instruct the participants in Kalehe how to tap the healing points. Do-In, a japanese self-massage, is very popular and releases tension in the body. David presenting group work on how the TTT and Do-In can be used in the acitivies of his organizations. Participants from the training in Luhwindja, a distant place that have suffered from conflicting armed groups fighting, killing and looting. With stiff fingers from hard work in the fields it is not always so easy to tap the right point.